The Canadian Rockies is one of the most picturesque travel destinations in North America with everything from dense wildlife to instagram-worthy views. 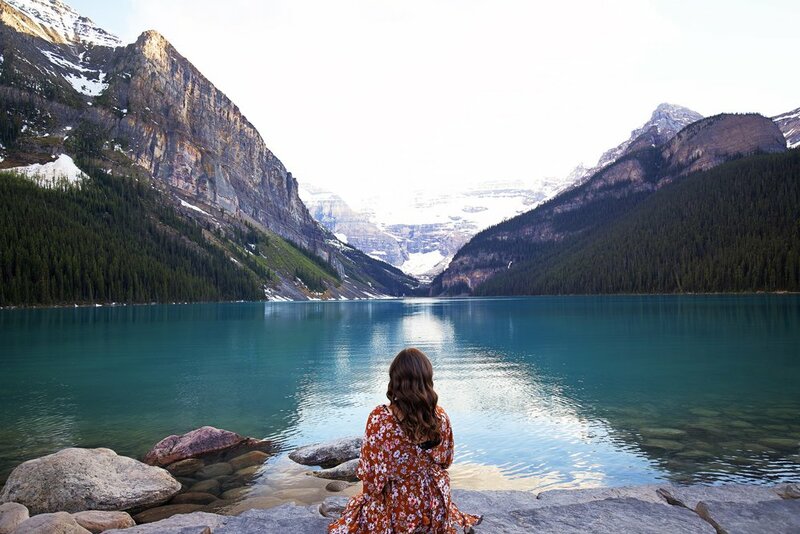 During my first ever visit to Canada in late spring, I was in awe of the majestic scenery that I experienced during my week-long vacation and am so excited to share with you all of my type-a tips you need to know to plan the perfect visit to the Canadian Rockies. 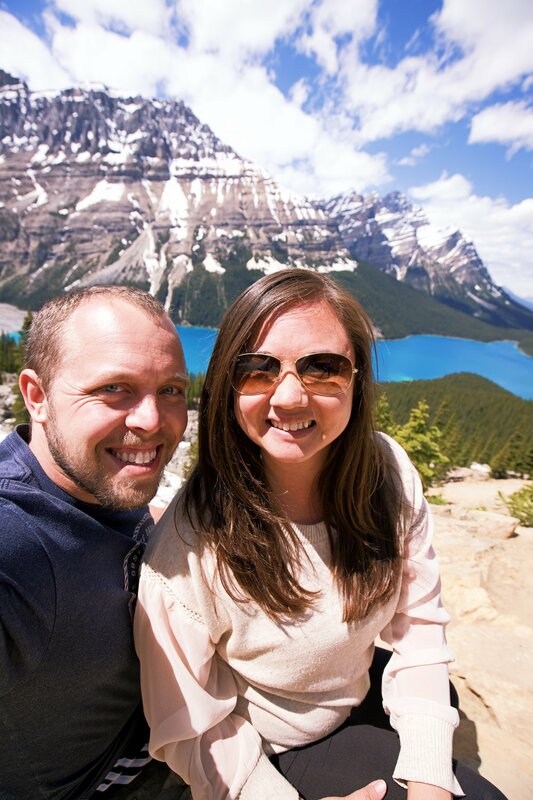 I’ll share my personal itinerary, starting in Calgary to Golden then up through the Icefields Parkway, ending in majestic Lake Louise, including where to stop, where to stay, where to eat and the best spots for fantastic photos along the way. Enjoy, aye!?! Some of your initial decisions about your trip will dictate the entire journey. Should you Drive or Fly? How many days should you plan for? What time of year should you go? I’ll help answer all of these questions so that you can get to the more exciting details ahead. 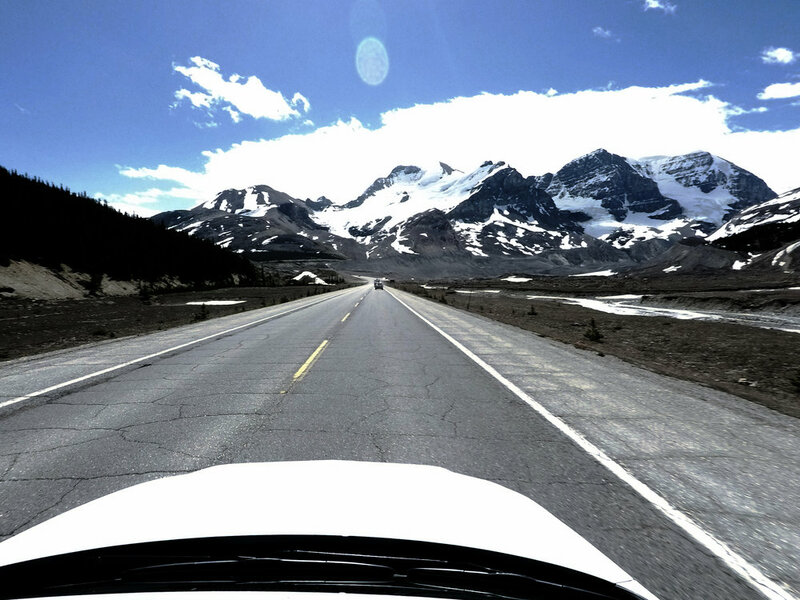 Driving is the absolute best way to explore the Canadian Rockies and unless you plan on taking a guided tour (not recommended) you’ll need to rent a car; however, unless you happen to live close by, you’ll definitely have to fly into a nearby city and rent a car. The Calgary International Airport (YYC) is the most obvious choice and it’s only a 1.5 hour drive to Banff (the start of the Canadian Rockies). If you’re a Southwest flying junkie like I am and you’re up for a bit more driving, you can fly into Spokane, WA and take the 6 hour drive to the western side of the Rockies. Finally, for a true roadtrip, you can fly into Vancouver, BC for a minimum 8 hour drive (ideally over 2-3 days to enjoy the sights along the way) to the start of the Rockies. Whatever option you choose will be full of adventure, but it’s important to keep in mind that this is just what it takes to get there - there will also be a lot of driving required throughout the Icefields Parkway - at least 2 full days worth. When it comes to renting a car, it’s not necessary to have an SUV or 4-wheel drive during the summer, but a full size vehicle with 4-wheel drive is recommended when there is snow on the ground, which is most of the year. Roads are very easy to navigate, well maintained and signs are easy to follow from June to September, but can be unpredictable, even during shoulder season. From late May through September, the most difficult parts of the drive are getting stuck behind big trucks, having to stop for long periods due to road maintenance and of course watching out for the occasional bear or oblivious driver who spots the bear and blocks the entire road to take a photo. If you can handle that, you’ll have no problem driving. However, from as early as October through April, the roads are not regularly maintained and heavy snow and ice cover the streets. I would not recommend driving the parkway during this time of year, but if you must - pack an emergency kit and know that cell phone reception is mostly non-existent between Lake Louise and Jasper. There are only a handful of gas stations along the drive from Banff to Jasper, so be sure to start each leg on a full tank of gas. There are also very few places to stop and eat in-between so you’ll want to pack snacks, drinks and ideally a lunch for the drive. You MUST hold a National Park Pass if you are driving anywhere along the IceFields Parkway, otherwise you will be given a hefty fine if caught without one. You can buy these passes online or at park entrances, but you’ll need to pay for the total number of days you’ll be in the park, per person (but for anything more than 1 person you can just pay for a family pass which is the cost of 2 people). Consider any days you’ll be driving from Banff all the way up to Jasper and beyond. For a detailed list of information about the pass, click here. There’s a very short window of time from mid to late June to early September to visit The Canadian Rockies when the snow is all melted and the lakes are completely clear of ice to show off their unbelievable turquoise color. So if you want that guaranteed perfect picture that you see all over Pinterest, that’s the time to go. But be prepared to crop people out or wait in line to pose at a cliff’s edge as June through September is is also the busiest time of year, with thousands of local and international tourists flocking to the mountains for their slice of Canadian pie (is that a thing? I don’t think so…). Anyway, if you’re ok with some intermittent weather and the possibility of a little snow and ice, I recommend late May/early June and mid-September to early October, known as “shoulder season”, when roads are clear of snow, days are cool but not too cold and there’s a fraction of people out and about. You’ll also find yourself on the right side of prices during these times of year when hotels and flights cost less and there’s much more availability. Unfortunately, it can be very hard to predict the weather though - as an example, on October 1 the Rockies were hit heavy with their first snow storm and roads were closed for several days… you just never know. Even just one short day through the Canadian Rockies is enough to fall in love, but to best experience it, you’ll need more time. In order to plan your trip, I’m going to break up how many days I think you need in each spot, then you can piece them together to total the amount of days you should plan for in addition to your travel time getting to Canada. You can read more about each location below to decide if it’s somewhere you want to add to your itinerary or not. In general, although you can probably do it in 3 nights, I highly recommend a minimum of 5 nights to get the most out of your time and to ensure you are not crazily rushing around, with an ideal timeframe being 1 full week. I’m going to break down each area of the Canadian Rockies, in the order that I visited in with all you need to know for a fun and fabulous stay. Calgary is the third largest city in Canada and has seen tons of growth and construction over the last decade due to the growing oil industry. Calgary is the easiest access point to the Canadian Rockies, being only 1.5 hours east of Banff and an excellent starting off point. 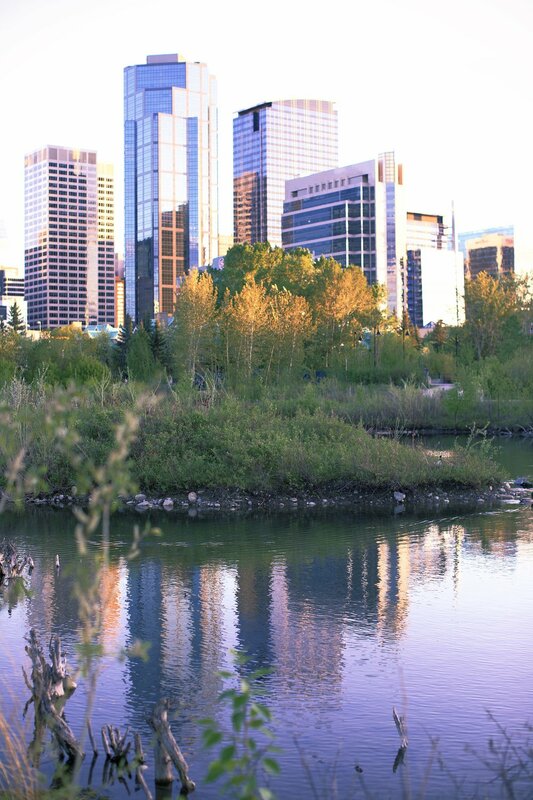 In reality, Calgary is another metropolitan city, with skyscrapers and major hotel chains and a few very good restaurants that are worth checking out while in town. I personally would not suggest going out of your way or adding extra days to explore Calgary, but it’s the perfect place to spend a night upon arrival or before your departure if you’re flying. I stayed at the Marriott Calgary Downtown Hotel which is centrally located within walking distance to sights and great dining options. Only 15 minutes from the airport, it is a very nice Marriott that I would definitely stay at again, for several reasons: 1) The M Club Member Lounge is stellar. We spent a lot of time here - mainly because the breakfast was hot and delicious and they put out various spreads throughout the day for members to enjoy between meals. At night they also serve a “sleepy tea” that steeps all day and is oh-so-delicious, not to mention I slept like a baby that night. 2) The hotel and rooms have been recently renovated and redesigned for a clean and modern feel. 3) The location is perfect for exploring downtown - we pretty much walked everywhere we needed to go. 4) Their hotel restaurant makes a really deliciously juicy burger that I think about more often than I should. The downtown food scene is surprisingly good, with a wide variety of options from traditional Canadian food to international cuisines and even fine dining. But while there are several highly rated restaurants in Calgary, there’s only one that I crave and that I ate at twice during my very short time in Calgary - Ten Foot Henry. 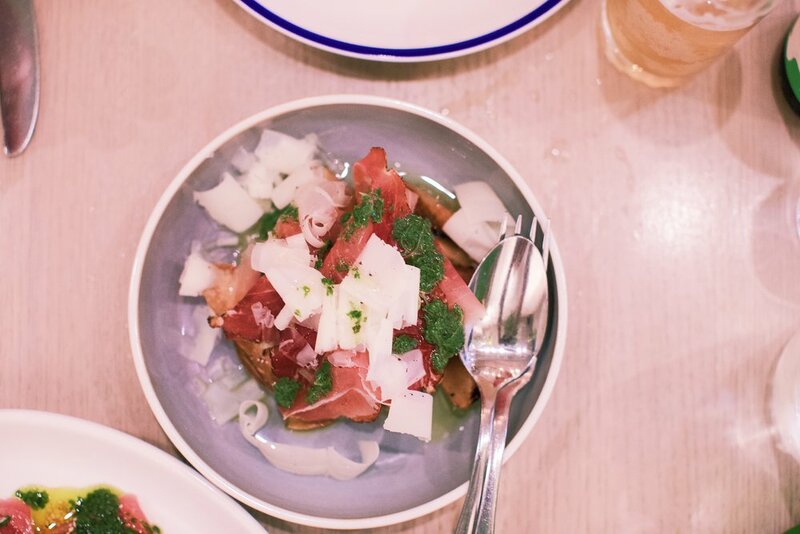 This bright and modern restaurant specializes in creative, veggie forward (hear me out) dishes that are fresh, vibrant and crave-worthy, all at a reasonable price. In both of my visits, I tried a good number of their dishes - all delicious - but there are two that made me rearrange my schedule and drive 20 minutes out of my way just to have it again: the bucatini and the butterscotch pudding. If I could seriously figure out a way for someone to overnight me both of those, I’d pick up a new side hustle to make it happen on a weekly basis. 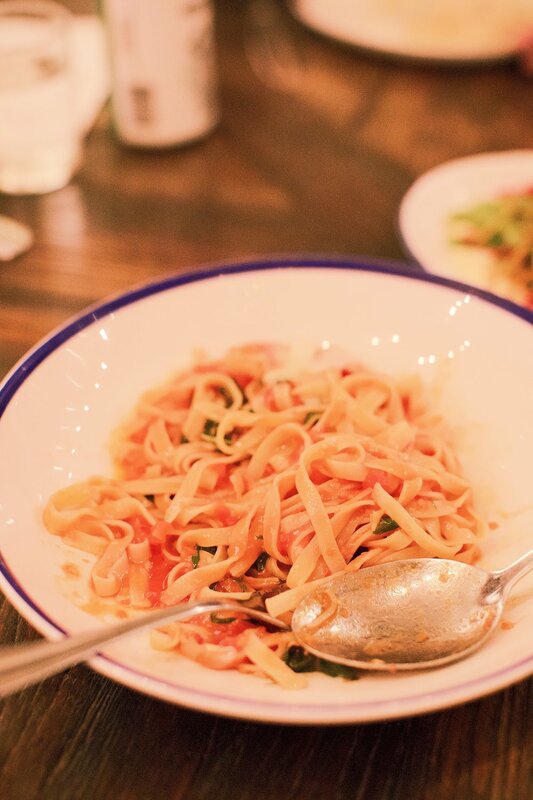 So bucatini is a very simple, traditional Italian dish that is basically just pasta, butter, cheese and pepper… that’s it. BUT it’s an extremely hard dish to get right and I’ve only found it done right (outside of Italy) at a place in New York, so forgive me if I was slightly shocked to find it in the middle of Canada. In addition, the butterscotch pudding is topped with these crunchy chunks of sponge toffee and it’s to die for - literally, I almost killed my husband for trying to eat my half… so we ordered another one. The second time, we each got our own - to save the marriage. Between the good food, good service and good prices, I’ll officially be coming here for the rest of my life. 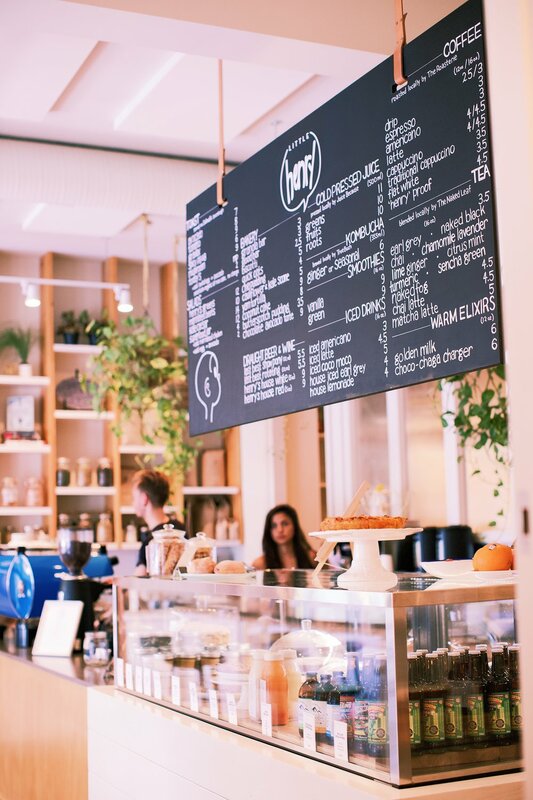 Type A Tips: Make reservations ahead of time - they get booked out even on weekdays and if you don’t have time for a full meal, check out their cafe next door, Little Henry. I don’t have a great answer for this - not because that means that there’s nothing to do, I just didn’t have enough time to figure it out. We did take a stroll through Prince’s Island Park, where you’ll find trees, trails and a surprisingly large number of roller-bladers along the Bow River. It’s a beautiful spot for an afternoon stroll - just be sure to wear your bug spray because the mosquitos are the size of birds out there! For our visit, we decided to drive from Calgary early in the morning and explore Banff for a day and continue on for the evening. 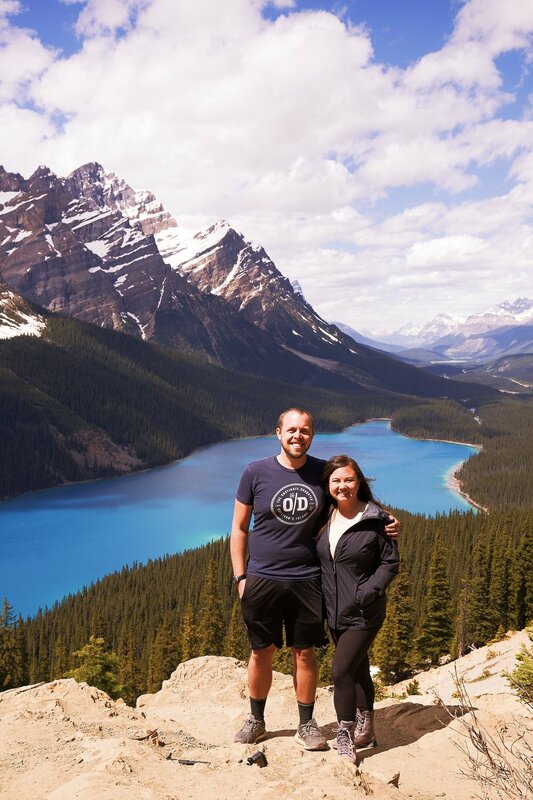 While Banff is known for great hiking, it’s hard hiking (not something I’m all that into, especially being scared of heights) so we didn’t feel like we needed several days for full-day hikes or anything like that. If you’re reading this, I’m assuming you’re similar in that way, so having a full day or just one night is probably enough. One of your only options for truly staying in Banff is in downtown, where you’ll still need to drive to get to much of what you want to see. It makes for a great starting off point, just know you are in or close to town opposed to being out in the middle of nowhere. Hotels in Banff book out far in advance, due to the limited number of accommodations, there are only a few luxury options and prices skyrocket during the busy summer months. By far the best hotel throughout the Canadian Rockies is the Fairmont, which dominates the luxury market in this area. Specifically, the Fairmont Banff Springs is stunning. Surrounded by mountain peaks, endless forest views the highest level of quality out in a valley all on it’s own - it’s the place to stay. Expect prices to range anywhere from $300-600 per night. I did not personally stay here, but do know several people who have and all have given great reviews. If you aren’t staying the night in the area, this is still worth a stop for a hot cup of tea or a quick drink at the bar to enjoy the magnificent views. 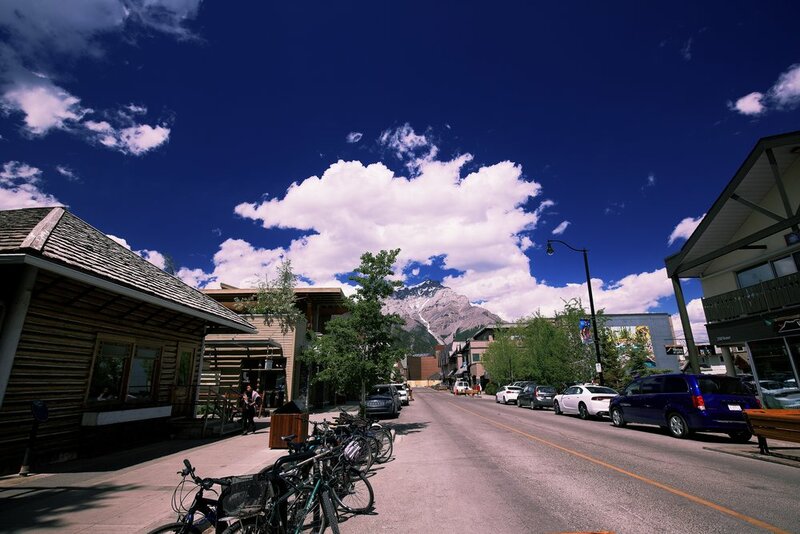 For more accommodation options at reasonable prices, you should check out the city of Canmore, which is just outside the park entrance and only about 25 minutes east of Banff. There are so many adventures you can take while in Banff, if you only have one day to explore, I highly recommend Johnston Canyon which has several levels of trails for all ages and activity levels. 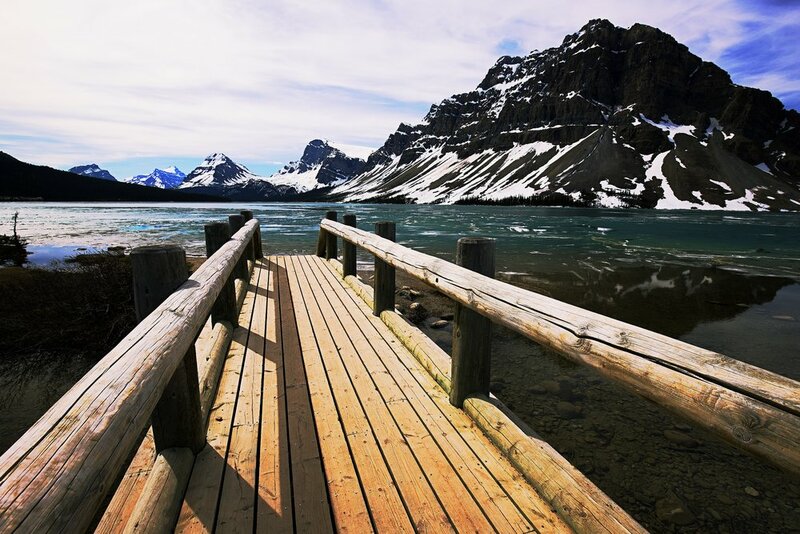 While it’s definitely a well known and can be overrun with tourists, t’s also where you’ll find one of Banff’s insta-famous spots that’s semi-secret and fairly tricky to find. 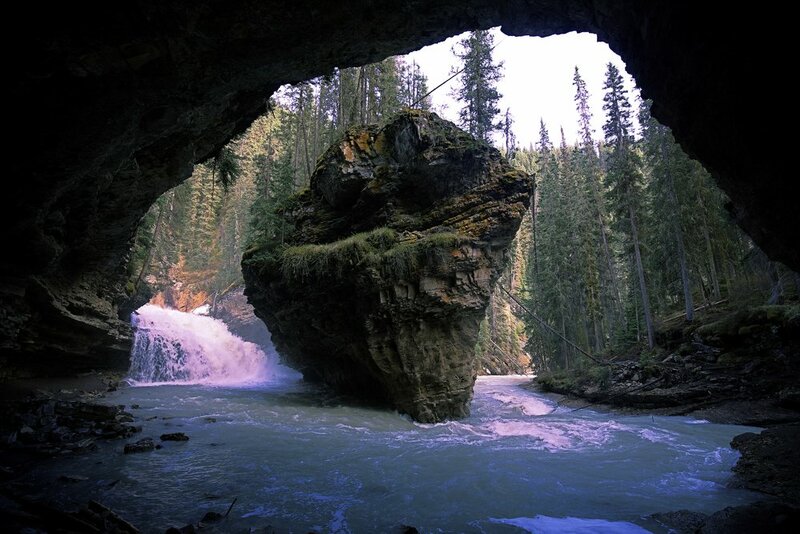 Johnston Canyon is located less than 30 minutes west of Banff, halfway between Banff and Lake Louise. You can spend as much or as little time as you have and get a lot out of it, which is why this is my #1 recommendation. There are 3 levels of the walk: Lower Falls, Upper Falls and the Ink Pots. You have to pass one to get to the other, so you don’t have to figure out a specific path - you can just decide to continue on as you reach each point. From the parking lot, it takes roughly 30 minutes to get to Lower Falls, walking along a path that takes you through a wooded area, then along the river. For the most part, it’s an easy walk with a slight incline. When you arrive at Lower Falls, there’s a decent sized water fall waiting for you and if you need to cool down, just follow your way through the cave at the end of the bridge and you’ll be rewarded with an up close view of the falls and a heavy spray of cold water (prepare yourself!). If you decide to continue on to Upper Falls, it’s another 30-45 minutes up with a steadier incline. On your way you can stop at the Secret Cave (pictured above) if you can find it. It took us quite a while to find it and once we did it was a bit of a challenge to get down to it. The best directions I can give are to follow your way to Upper Falls, once you get to a green railed area that’s not just a path, it’s more of a wider, open section with a multi-way sign that says Waterfall Lookout 155m/Ink Potts 3155m/Upper Falls 110m (see picture below), you are just barely beyond it. If you look over the railing to your right, you’ll see the top of the “rock” shown in the photo, but it won’t look anything like what you’re looking for (I didn’t believe my husband when he pointed it out). You’ll literally be standing on top of the cave at this point. Turn around and you’ll see a trail that leads down towards the cave on your left and you’ll just follow that the best way you can down to the cave. Depending on the rain and the river, it can be slippery and muddy so be prepared. Follow the step-by-step photos below for added help - I hope you’re able to find it! From here, you’ll continue on to Upper Falls. From the cave it’s really close, so don’t turn back now. 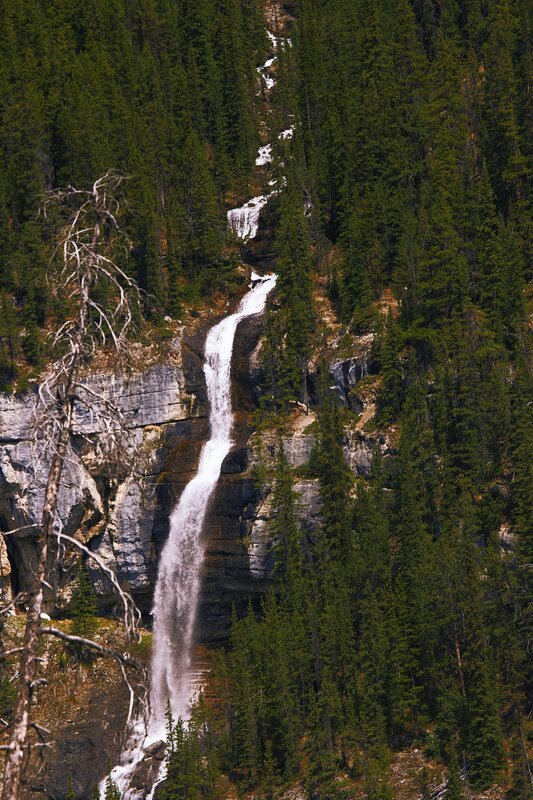 Like lower falls, the closer you get, the wetter it will be. If you are bringing a non-water-proof camera, be sure to have something to put it in or cover it with because you and it are bound to be soaked if you make it to the end of the bridge. Now getting to the Ink Pots beyond the Upper Falls is a half-day journey and not for the faint of heart. I had absolutely no desire to do it so have nothing at all to share about it - other than good luck! West of Banff is Yoho National Park, a much lesser known park in the Canadian Rockies, but has arguably some of the most beautiful spots. From Johnston Canyon we drove straight west where we stayed two nights in Golden, a city just on the outskirts of Yoho. In the midst of very fast and busy travel schedule, we wanted some down time and this seemed to be the best place to spend it. There is a gorgeous set of cabins in the Golden hills called Mount 7 Lodges. This group of 3 secluded lodges is on 60 private acres, where horses roam the flower filled fields and you are surrounded by peace amidst the deep forest. The cabins are fully equipped with everything you need to stay all day or return to after a long hard day of exploring - with full kitchens, satellite tv and even hot tubs on the porch of each cabin - you may never want to leave. Did I mention that the views from the porch make you feel like you’re in the clouds? Well, Wife and husband owners, Jo-Anne and Dave, are lovely hosts and have the most incredible story of how they went from London professionals to visionaries of a mountain lodge. 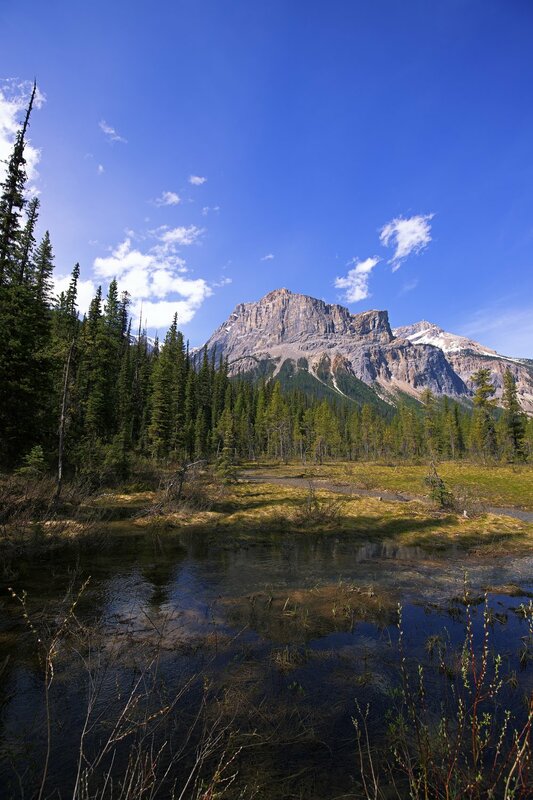 Mount 7 Lodges is Golden’s hidden gem and puts you less than an hour away from Yoho National Park, including Emerald Lake. Do note that there are only a small number of places to stay in/near Yoho. Emerald Lake Lodge is one of the few, but unfortunately is very pricey and has pretty poor reviews overall. 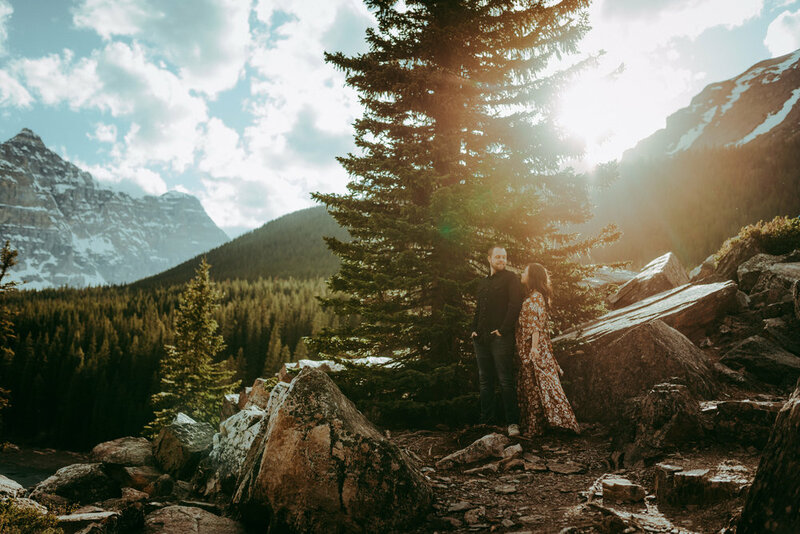 There are a number of sites to visit in Yoho National Park, including Takkakaw Falls and Natural Bridge, but the most beautiful is Emerald Lake. The best way to enjoy the lake is by kayak, which you can rent there, or just by walking around the lake itself. Very few visitors actually walk farther than the parking lot so even during the busy summer months, you’ll feel like you have the trail all to yourself. The entire loop takes about 2-3 hours at a slow pace and is very easy. When we were there, the snow was still melting so it was a bit muddy and slippery on the right side of the lake, but otherwise there were no issues to note. The views from each side of the lake are beautiful and as you reach the farthest end of the lake you get to excellent views of the surrounding mountains. There are longer walks from the far end of the lake that you can follow, but do increase in difficulty. There is a cafe with food and drinks at the Emerald Lake Lodge if you’re hungry by the end of your walk. Type A Tip: The parking lot is small and get full quickly, so park on the street outside the entrance if you can’t find anything. The Icefields Parkways is the most incredible drive I’ve ever been on - it’s full of wildlife and unbelievable scenery. 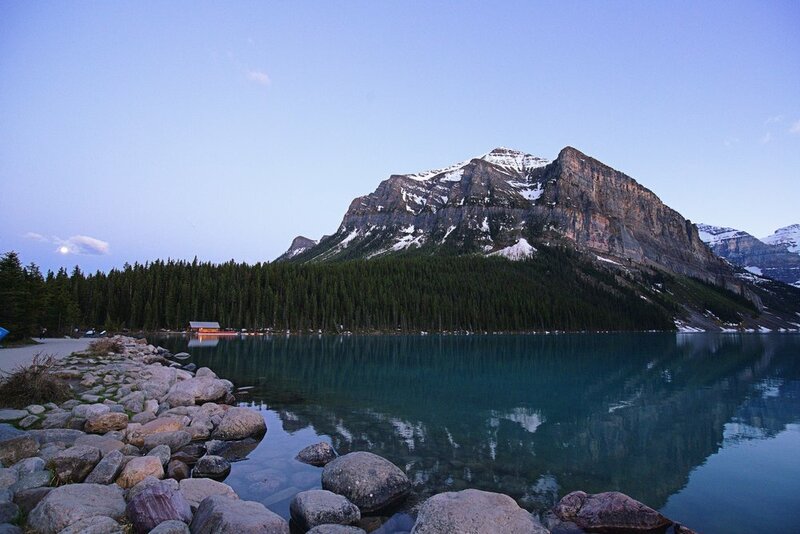 The drive takes you from Lake Louise to Jasper and back, roughly 235 km each way. While the entire drive there and back can be done in a day, it’s a very long day and best broken up, staying at least one night in Jasper. As long as the roads are open, the drive is very simple with constant stops along the way. I’m definitely not the expert on this drive, but the writers of Banff and Beyond truly are, so I’m going to refer you to their expertise to plan your trip. I scrutinized over what spots were worth stopping for, but the reality is that there are a few “must stop” destinations, otherwise you can simply decide as you go… and while I realize that’s the complete opposite of being Type-A, you know it must be true if I’m the one saying it’s ok! I’ll take you through a quick photo journey of my favorite spots, while also mentioning a few worth skipping. The stops are in order coming from Lake Louise, driving up to Jasper; however, we didn’t stop at some of them until our way back down so don’t feel like you have to do them all during the first drive. It’s best to leave some for the way back, especially the easy, less spectacular ones. 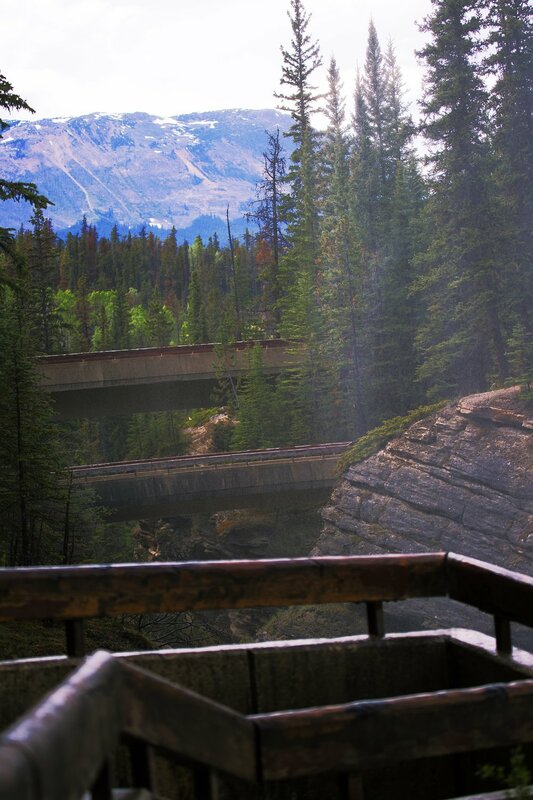 While there are a few accommodation options along the Icefields Parkway, they are mostly motels and hostels, some without electricity or running water. The Num Ti Jah Lodge is probably the nicest accommodation, but is rather pricey due to the remote location and is still a rather long way away from Jasper. My recommendation would be to drive up in one day and stay 1-2 nights in Jasper instead of attempting to stay in-between. There aren’t many places to stop for gas (but there are a few, including Saskatchewan Crossing which is about halfway through the drive), so be sure to fill up before you begin the drive, which you can do in Lake Louise as well as Jasper. Pack a lunch, snacks and waters. The food options along the way are few and far between so it’s best to bring your food with you. We simply packed peanut butter and jelly sandwiches along with some chips and a few large jugs of water and that was enough. During shoulder season, there is often construction which can delay you up to an hour, so be sure to have a flexible schedule and leave yourself time in case you get stuck at a construction stop. Plan for a minimum of 6 hours each way - it always takes longer than you think, no matter what Google Maps tells you it will be. If you think it will be 6 hours, you should probably plan for 8. 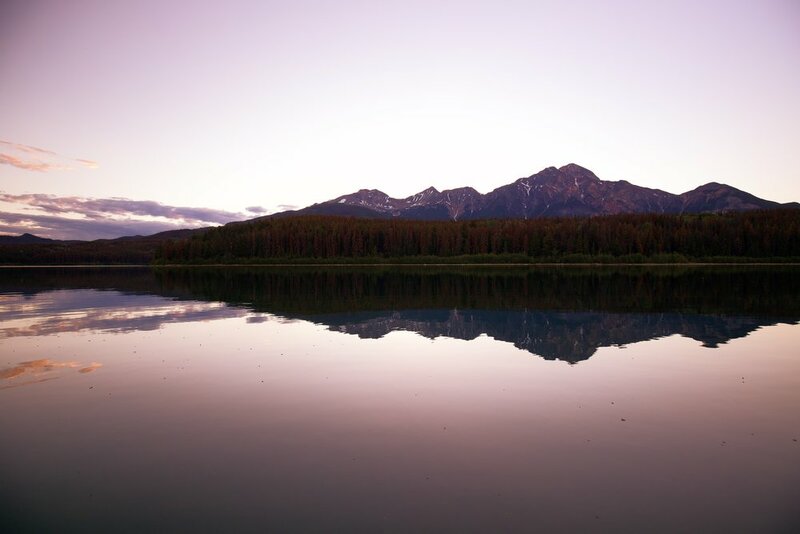 Leave early in the morning (5amish) for the drive up to Jasper - you will get the best views of the lakes and hopefully, beat most of the tour buses and arrive in Jasper before dark. Keep in mind that during spring and summer months it will stay light out until 9pm and later. In May, it wasn’t completely dark until closer to 11pm, giving us lots of daylight to enjoy being outdoors. Weather and temperatures can change quickly and drastically depending on where you are at the moment so it’s best to keep layers in the car, including a rain jacket and extra shoes in case you get caught with a wet boot from stepping too far into a puddle. There were moments I wasn’t wearing more than a t-shirt and light pants, to bundling up with a heavy jacket and gloves - all within the same hour, so it’s best to be prepared. Herbert Lake is the first major stop along the parkway, only about 15 minutes/6 km from Lake Louise. If you get here early enough and the winds are calm, you’ll find a glassy reflection of the surrounding trees and mountain peaks waiting for you. You may see people standing along the road for a shot, but go just beyond there to the parking lot and walk down to the water. Don’t be afraid to walk around to get a better view; however, don’t stay too long - keep in mind that this is just stop one and there are a lot more to come! You’ll get your first glimpse of that famous turquoise water that everyone posts about just beyond as Hector Lake peaks out through the trees. There’s a lookout point where you’ll be able to take photos of Crowfoot Glacier mounted above Hector Lake like a looming cloud. There is a hike to Helen lake on the opposite side of the road from the lookout; however, it was closed when we were there so we continued on without seeing it. Bow Lake and the Num Ti Jah Lodge is next up and is your first spot for a bathroom and meal break. As you pull into the parking lot, you can easily walk down to the water’s edge to take in the view. Be sure to weave your way around all the way to the lodge because the different viewpoints are worth exploring. While we were there in late May/early June, the snow and ice were still melting, leaving the ground quite slushy, so wear appropriate footwear. The Num Ti Jah Lodge does serve food and is a nice stop for a cup of coffee or hot chocolate before continuing along. We chose to get back on the road because we realized we were getting behind as several large tour buses pulled up just as we were about to leave. Now, for photographers and explorers - this is your worst nightmare! So if this happens to you, get in your car and put some distance between yourself and these monstrosities or you’ll soon regret it. If you truly want to stay along the Icefields Parkway, the Num Ti Jah Lodge is your nicest option outside of hotels and hostels; however, due to its location, it is very pricey for a rustic hotel. Peyto Lake is my absolute favorite stop along the Icefields Parkway, despite the 20+ minute hike to reach it, which is saying something! You reach it about 45km into your drive from Lake Louise and we actually loved this spot so much that we stopped both on the drive up and back. From the parking lot (which can get very crowded), there are two ways to reach the lake… from the car parking lot the walk is about 20-30 minutes along a narrowish path OR you can follow the road out of the car park towards the Bus lot and walk to the lake from there which is much easier and faster. Believe me, I know because I tried both unfortunately. If there’s snow still on the ground, the main trail from the car lot can be slippery, causing me to slide around quite a bit. If you’re not up for such a delightful adventure, definitely take the short-cut from the Bus lot. Once you reach Peyto Lake, you will think your eyes are playing tricks on you, but believe me, the water truly is that shade of blue. The best selfies and shots are best taken by climbing over the deck railing (it’s really easy from the back side of the deck) and walking down towards the rocky edge. It’s not really an edge, there are several levels you can walk carefully below, but if you’re scared of heights like I am… you really don’t give a sh*t and have no problem keeping at least 8 feet away from where it looks like an edge. Keep in mind, the line to get the money shot can get pretty long, especially when groups of teenage girls are in front of you and decide they need every combination of friends standing in different positions including a multitude of selfie angles sporting duck lips (faces they will inevitably regret making in about 10 years) while pretending to look off into the distance as if it’s a candid photo before they can let the next people go… you know who you are! A quick warning to all of those with tripods - I set up my tripod for a shot of Colin and I on the reasonably steep incline as we sat on a rock, which was a great idea until a massive gust of wind ripped through the air and it came tumbling down towards me on the second take. As I watched my very new, very expensive camera hit the ground before my eyes and panic took over because I was too scared to jump and grab it since I was way too close (8 feet away) from the ledge… I thought my photography-life was over. After dusting it off and being thankful for only a cracked hood and broken UV filter, I decided that I’d ask someone else to take the photo for me as I suggest you do too. Truth be told, I have absolutely no idea what this spot is called, but I can tell you that it’s a river bed area with picnic tables that you reach about 45 minutes beyond Peyto Lake and 15 minutes before the Weeping Wall just after the Saskatchewan Crossing… sorry that’s not more helpful. We just happened to pull in because I really wanted some photos of the river flats and there was a large parking lot. It’s a perfect spot to stop for lunch because you have surrounding views without having to hike or walk far from the car. If you find it, please let me know what it’s called! As you climb in elevation, you’ll see a lookout with several waterfalls just off the road, including Bridal Veils and Weeping Wall. You’ll know you’re there when you see a ton of cars, most likely parked terribly as they rush to jump out of the car to take a photo - I’m not sure why they insist on moving so fast, it’s not going anywhere (insert confused emoji). It’s an easy spot to stretch your legs and take a quick photo, but that’s about it. You’ve reached just beyond your halfway point (128 km from Lake Louise), the Columbia Icefields Visitors Center - you can’t miss it, it’s massive and every tour bus stops here. They have a gift shop, cafe and restrooms - if you’re willing to fight through the crowds. You can also book your glacier tour or glacier skywalk here, but it’s best to book in advance. Personally, we skipped all of it. Honestly, the whole thing was an ordeal as far as parking and booking a tour. What I didn’t realize when I was doing research is that to go on the skywalk (a clear glass pathway looking straight down into the valley), you do it through the tour, which is fairly time consuming. We didn’t have that much time since we wanted to make it to Jasper before it was too late, so this is one attraction we chose to skip. If you decide that you can’t live without it, just give yourself at least 2 hours to make it happen. Instead, we drove across the street where there is a small parking area at the foot of the glacier for a few photos then decided to drive just beyond the visitors center at a little rest stop along the drive where we could enjoy the views and sneak a kiss. Up until this point, we hadn’t seen much wildlife at all along the drive. However, this changed once we were beyond the Columbia Icefields. Keep your eyes open for for bears, elk and goats along this part of the drive and do not get out of the car, especially when bears are around. 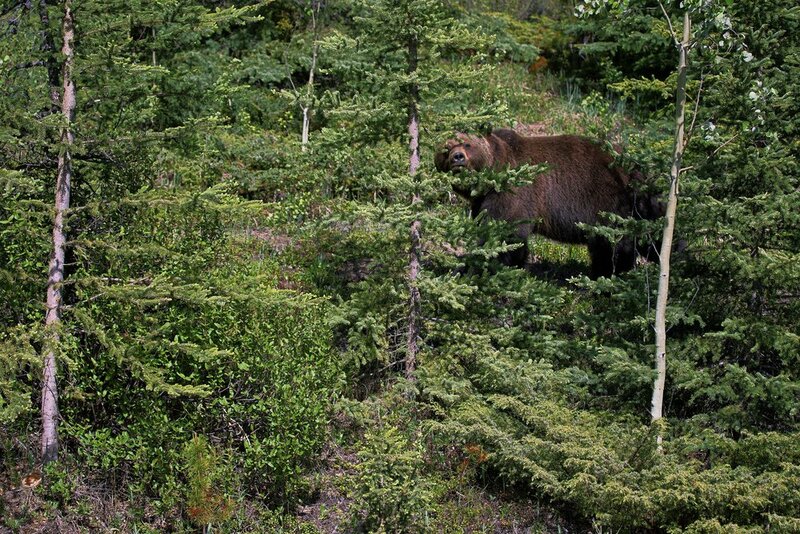 When we were there, the bears were just emerging from hibernation. The brown bears were especially drunk with hunger and I saw too many people out of their cars, just feet from the bears, trying to get a photo. Just don’t be an idiot, stay inside folks. 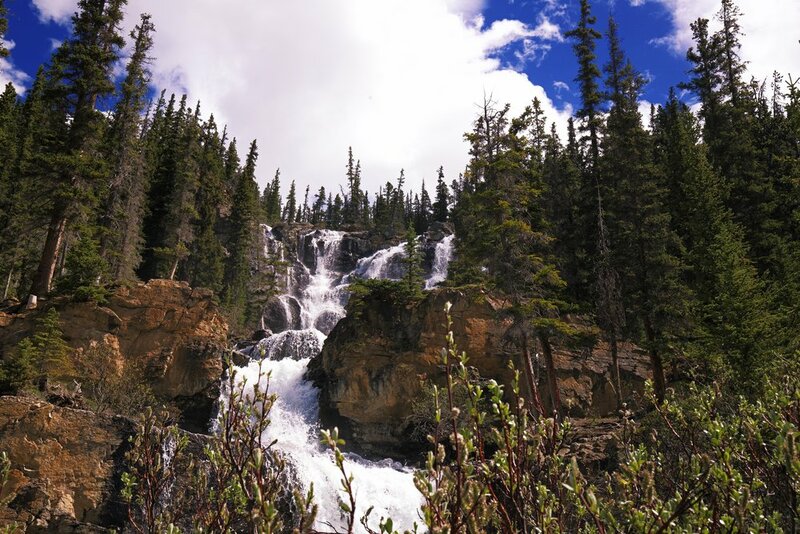 Tangle Falls is will appear on your right side as you are going north along the Icefields Parkway; however, it come up fast… so fast that we didn’t even notice it on our way up. The parking lot is on the opposite side of the road and is easy and fast to reach on your way back south, which is exactly what we did. I don’t go crazy over waterfalls, but this one was really enjoyable, especially since it was so easy to access. If you need to get some energy out, you can actually climb/hike up the right side of the falls and get super close, which Colin chose to do as I waited safely at the bottom. 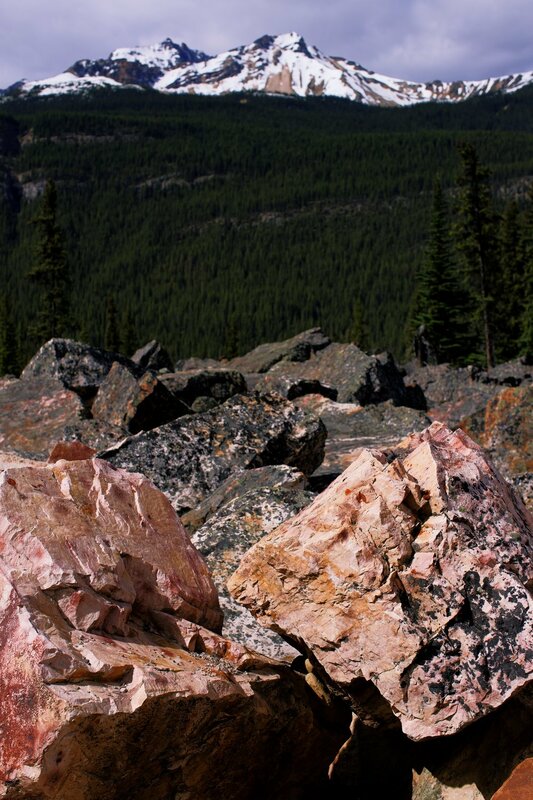 Next up you’ll pass the Quartzite Boulder Field. If you’re all obsessed with the color “Millenial Pink” like I am, you have to stop because these massive boulders are beautiful and just happen to match my living room at the moment! The Kerkeslin Goat Lick was one of the spots I was most excited about, mainly because these mountain goats are extremely difficult to find in the wild. Due to the natural silt in the rocks along this ridge, the mountain goats spend a lot of time here and along the road (watch out for them as you drive). When you start to see road signs with goats on them, you know you’re close. There’s a parking lot on the left side of the street (if you’re going north) and that will lead you to the viewing area where the goats can be found. The goats are usually a bit of a distance away, especially due to the angle, so you’ll want your telephoto lens for the best shots. We spent embarrassingly too much time here, the goats are just so fun to watch, especially as they scale the massive cliffs. 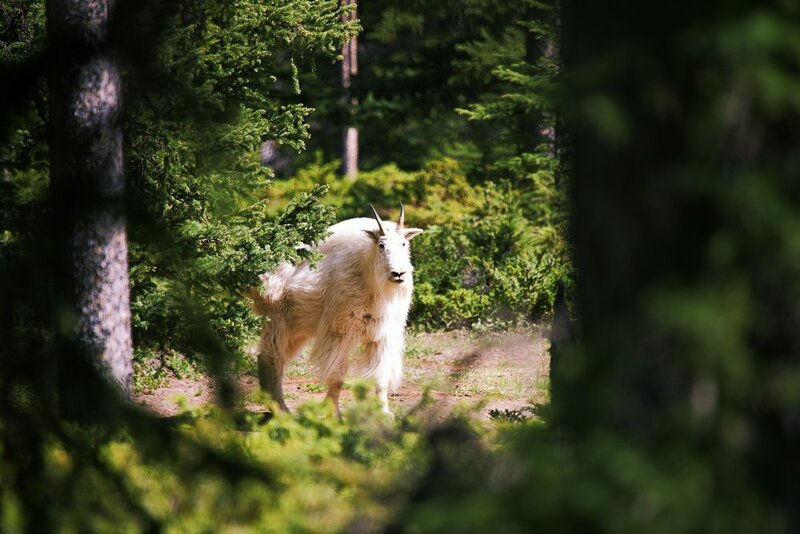 Fun fact - did you know that mountain goats actually aren’t goats at all? They are part of the antelope family… who knew?!? Not into goats? That’s weird, but I get it - the views are breathtaking from this spot and overlook an entire valley. If you don’t like the view or the goats, then I really can’t help you. 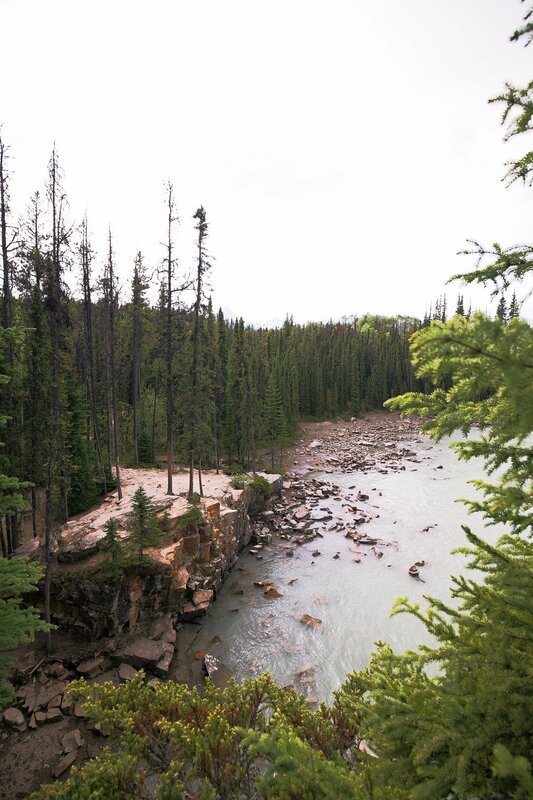 Athabasca Falls is one stop not to be missed. Like I said, I’m not big on waterfalls, but the Athabasca Falls are so massive and powerful and unlike anything I’ve ever seen. If you are on your way to Jasper and find yourself exhausted with little time left in the day, I recommend skipping it and allotting at least 1 hour for a visit on your way back south (it’s roughly 32 km from Jasper). From the very large parking lot, you’ll immediately make your way towards to the falls where you are hit with the sheer volume of rushing water racing into the canyon. There are a plethora of paths and overlooks that you can follow, allowing you to take in every angle of this magnificent sight. But don’t head back after watching the falls for a while, follow the water all the way down where the path leads you to the serenity on the other end where the water settles and trickles through the canyons on the other side. You can actually walk down to the rocky water’s edge and stick your feet in the freezing cold water. For my photographer friends, Athabasca Falls is a dream spot. You’ll definitely want more time to explore as you may just find yourself shooting a pool of water set inside a cave for 20 minutes. I took far too many photos… which I’ll share with you because I can. This was my final stop along the Icefields Parkway before reaching Jasper (up next). The entire journey from Lake Louise to Jasper took roughly 10 hours, with frequent stops and packing a lunch. The way back, with way fewer stops, took closer to 5 hours to reach Lake Louise. The drive along the Icefields Parkway is truly unforgettable and deserves all the extra time and attention you can give it. 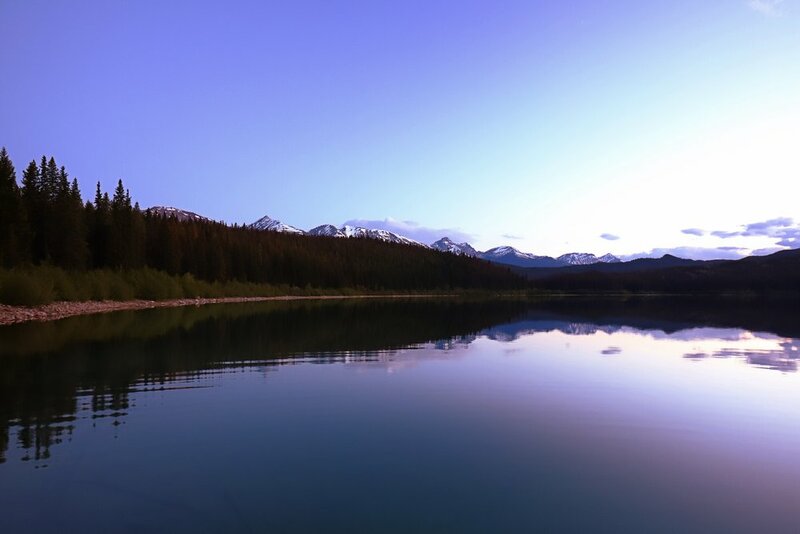 If you make it through the Icefields Parkway to finally reach the town of Jasper, you won’t be disappointed! I actually liked Jasper way more than Banff - it felt more authentic, more personal. Banff was full of tour buses and mainstream stores, where Jasper was quaint and charming without being too small. I cannot be more insistent that you plan at least two nights instead of one, which is far too short to enjoy it to the fullest. After such a long drive, you won’t have much time to do anything other than check into your accommodation, eat some dinner and sleep. If you have to leave the next day to drive back down towards Lake Louise, you won’t have nearly enough time to visit some of Canada’s most magnificent northern sights - and let’s be honest, when will you be back here again? I really only have 2 regrets of the trip and only staying in Jasper for 1 night is one of them’ don’t make the same mistake I did. 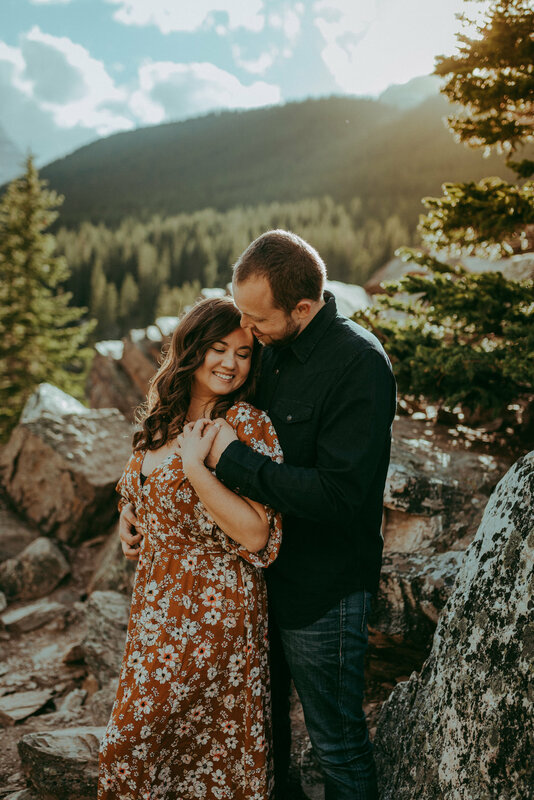 There are a decent number of accommodation options in Jasper, ranging from camping to high-end luxury resorts like The Fairmont Jasper Park Lodge where the royal couple just spent time during their honeymoon. 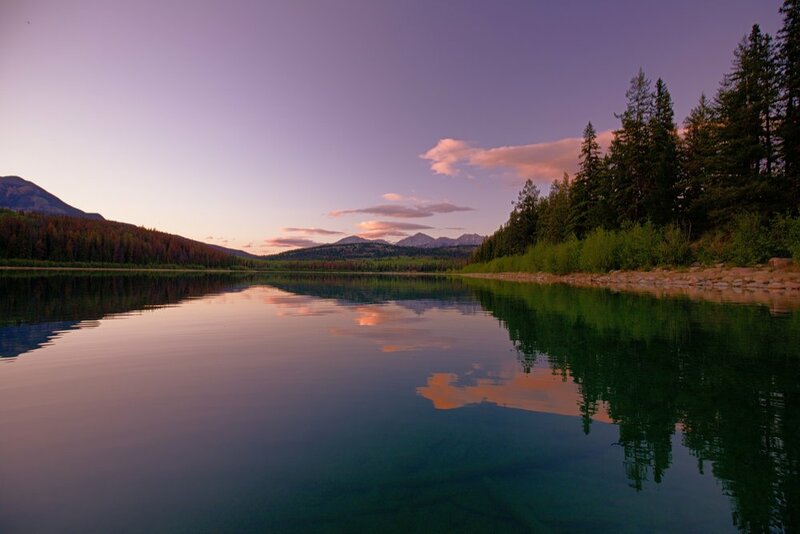 Since we were already staying at The Fairmont in Lake Louise, I was looking for something a little more rustic with a woodsy feel, which is why I booked our stay at Patricia Lake Lodge on picturesque Patrica Lake and about a 10 minute drive from Downtown Jasper. There are a plethora of cabin options to choose from, simple cottages to lake-front, multi-room log cabins for families and larger groups. 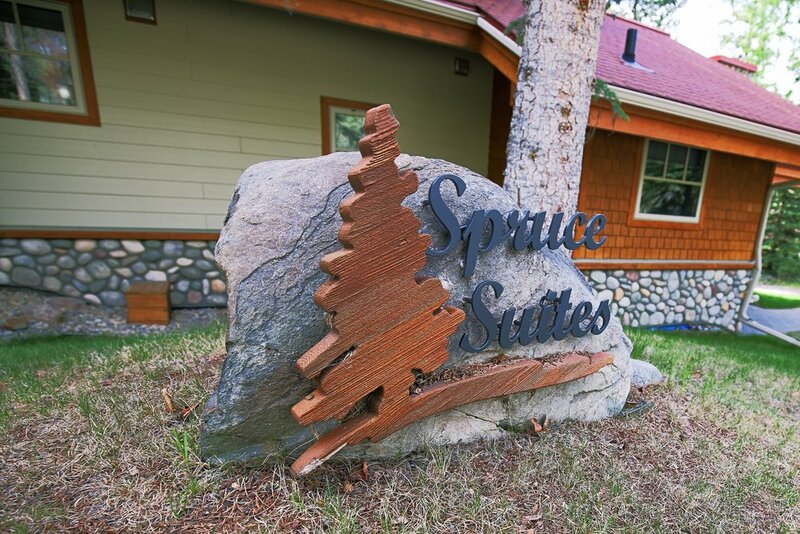 We stayed in the Spruce Suites, which are on the far end of the grounds, so it feels a bit more secluded and quiet. These suites are brand new, with completely upgraded amenities, a fully stocked kitchen, spacious living room and everything you need to stay a while including a gas grill and outdoor patio. 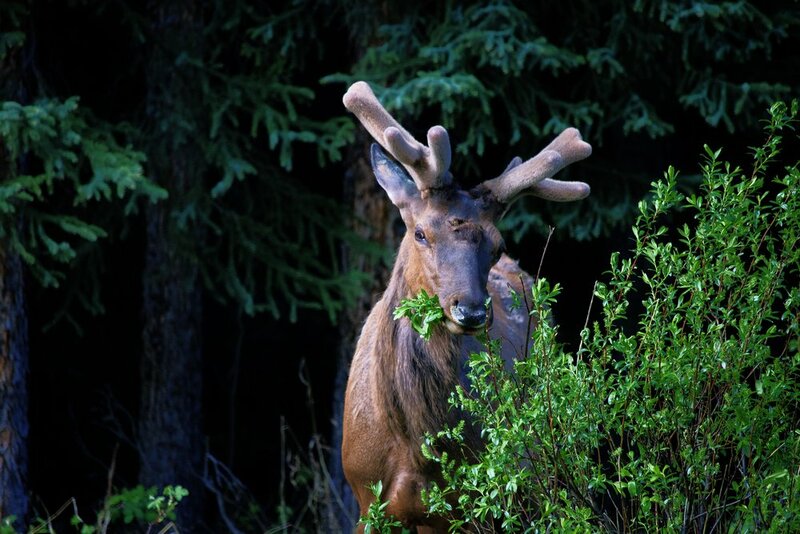 When we woke up in the morning there were elk eating right outside our window and in the evening, I sat practically alone on the dock watching the sun set over the lake and the surrounding snow-capped mountains. If you are a star gazer, Patricia Lake and nearby Pyramid Lake are some of the darkest locations in Jasper, making it ideal for night photography. Unfortunately for me, I waited up until about 1am and the sky had cloud coverage and wasn’t dark enough for the stars to make an appearance - it really does stay light for a very long time in the summer! Saying that, when the water is still and all that you can hear are the rustling of the trees, there’s nowhere I’d rather be - I literally sat there by myself for hours with my tripod trying out different exposures and capturing the light as it transformed the lake throughout the night (see photos below). 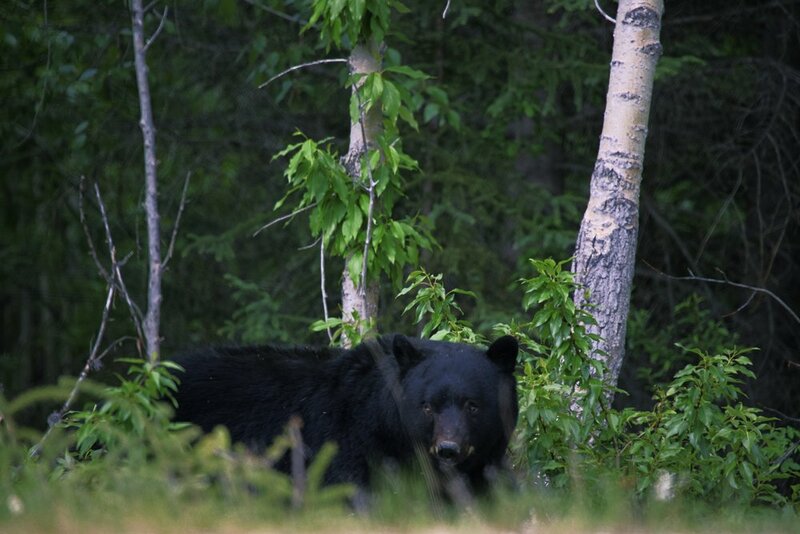 But do beware that bears are in the surrounding forest and walking back in the dark was a bit scary, so be on the lookout! Patricia Lake Lodge reminded me of that summer lodge in Dirty Dancing, where there are nightly activities, kayaks and bikes available, fishing and campfires - everything you need to enjoy the great outdoors while still having complete luxury when you walk inside your cabin door. Everything from the customer service at the front desk to the thoughtful touches in the cabins made for a perfect stay and I can’t wait to return to experience all that the lodge has to offer. Type A Tip: Be sure to book your stay in advance though because these coveted cabins book out quickly during the busy summer months. Like I said, we didn’t have a ton of time in Jasper, so we didn’t get to experience much of the downtown scene; however, both places we tried were very good. NBA finals were on while we were there so we wanted somewhere casual and that had the game on when we finally arrived in Jasper, so we chose the Downstream Lounge, which is a casual pub with innovative Canadian dishes right off of the main street in downtown. The food and atmosphere were exactly what we needed for a casual night and we finally got to try poutine for the first time… I get why it’s a Canadian favorite. In the morning, on our way out of Jasper, we stopped to grab a quick breakfast and snacks for the drive at Bear’s Paw Bakery, also right off of Connaught Drive, the main road in and out of town. Everything at Bear’s Paw Bakery is homemade, decadent and delicious - and they even have gluten free options! We stocked up on everything from hot chocolate to bagels and scones and whatever else we were craving for the long road ahead. Do keep in mind that the line can get pretty long in the morning - this is a local favorite - so either plan on at least 20 minutes to get your pastries and go or check out the grocery store just around the corner for something less tasty, but faster. One thing that I had been searching for all throughout Canada was a dress - we had a photo shoot coming up and I didn’t have anything to wear! I didn’t have time to find something while in Calgary, so searched high and low for a halfway decent store along our journey, failing miserably until late on a Sunday night I walked into Tea Leaf Boutique in downtown Jasper. I nearly cried when I came in because I was so thankful to find a maxi-dress that wasn’t from the Gap! The styles and designers they carry are perfectly on point and the sweet young woman who was there that evening did everything she could to find me the right outfit for the occasion - she’ll always be my little Jasper fairy godmother. Definitely stop in for the latest trends in clothes, shoes and accessories; Tea Leaf Boutique is THE SPOT in Jasper for high-end fashion. Moraine Lake is one of the most famous lakes in the Canadian Rockies and for good reason, it doesn’t get much more beautiful than this. Located just 15 minutes from Lake Louise, this blue lagoon surrounded by lush greenery and towering mountain peaks should be on your Rocky Mountain bucket list. If you find yourself driving by the road to the lake and it’s blocked off, it means that that parking lot is currently full and they aren’t letting anyone in. I thought it meant the lake was closed for the day, but that’s just not the case. Try driving around for 5 minutes and coming back - that worked for us; however, if that’s not the case you may be routed to a nearby parking area and will have to be bused in. To avoid this, try getting here early in the morning or late in the afternoon. Also note that there is only one road entry into the lake so if your GPS is trying to re-route you an hour out of your way - it’s wrong! The entry to Moraine lake is no more than 15-20 minutes from Lake Louise, so don’t be guided in the wrong direction. There is a cafe and older lodge at the lake, but that’s about it. You’ll initially be met by dozens of tourists at the foot of the lake; however, if you walk even 5 minutes down the path, most will have vanished and you’ll find some peace and quiet and some excellent photo opportunities. It takes about 30 minutes to walk to the other end where the ice cold waters melt into the lake, but you should probably plan at least 2 hours so you can take your time walking around this majestic spot - the romance of it all can be very distracting! When you travel to one of the most beautiful places on the planet, you want to remember it with more than a selfie, which is why I always recommend hiring a local photographer to capture some precious moments in iconic places. 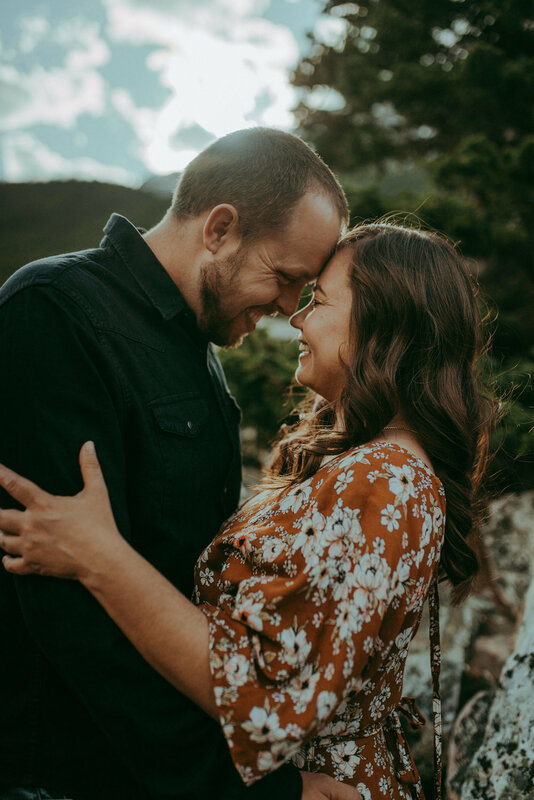 I was in search of a photographer that could combine the stunning scenery with some candid(ish) photos of us - so when I found Celestine Aerden Photography, I knew she was the one. Celestine is an incredible photographer, seriously - check out her Instagram account, her photos are insane. Originally from Belgium, she has found a home in Alberta where she photographs some of the most iconic locations in the Canadian Rockies. She has a natural ability to make you feel completely at ease and extract tiny, intimate moments that will leave you with all the feels for years to come. We chose Moraine Lake for our location because it’s less photographed than Lake Louise and the blue of the water is extraordinary. Walking up the rock mountain looking down over the crystal lake was such a surreal experience and having Celestine there will ensure we can remember that time forever. All it took was one fun and easy hour with Celestine and now I’ve got these shots hanging on our walls, transporting us back to the magic of Moraine Lake - we couldn’t be more grateful for the lovely gifts she’s left us with. You can read all about our photo session with Celestine on the blog and check out even more of her epic shots, just click here. We saved the best for last, spending our final night in Canada on Lake Louise. After exploring the most incredible sights up and down the Canadian Rockies, I can honestly say that Lake Louise is the one that completely took my breath away. We were lucky because the day we arrived was the first day that all of the ice had melted away and the lake was shining in all of her glory. During the very busy summer months, Lake Louise can be tough to reach directly by car unless you are staying at the Fairmont Chateau Lake Louise. There is a parking lot near the lake, but it becomes full very early in the day so most cars are turned away to the Samson Mall/Lake Louise Visitor’s Center parking lot where guests are then bused to Lake Louise and back. I’ve heard some bad stories of people waiting forever for a bus, just to get there for a quick glance and have to turn back around to catch the next bus. The point isn’t to scare you, but it’s best to be prepared if you are traveling during June through August, otherwise you could be in for a big surprise (and not the good kind). If you are not staying at the hotel or have reservations at one of the restaurants at The Fairmont, it’s recommended to plan your arrival before 8am or after 6pm. You can also click here for shuttle and transportation options. 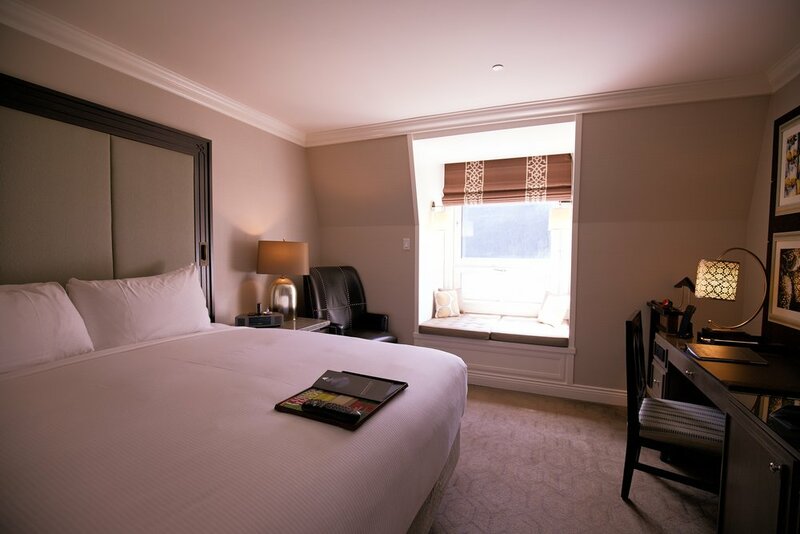 There are a number of options within the vicinity of Lake Louise and the village, but there is only one on Lake Louise and that’s the Fairmont Chateau Lake Louise and it is worth staying at for the full experience. 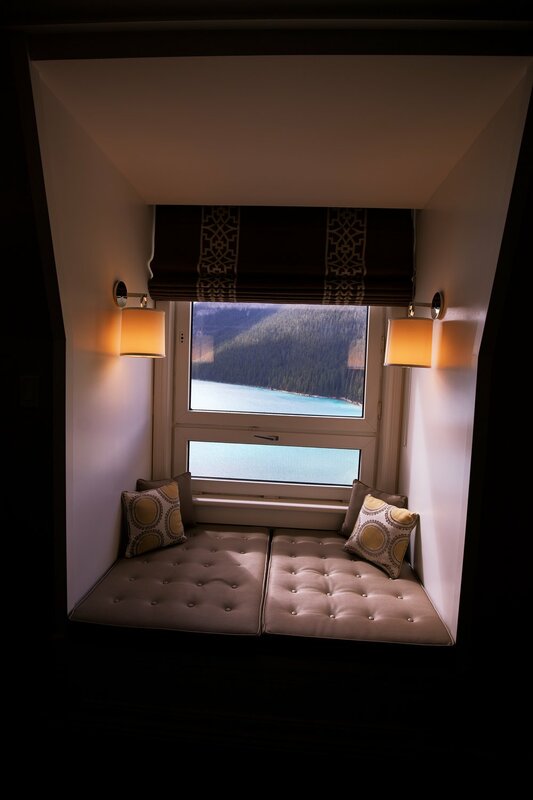 There’s nothing like waking up and looking out your bedroom window at the unreal view of Lake Louise below you, even if it’s only for a night. 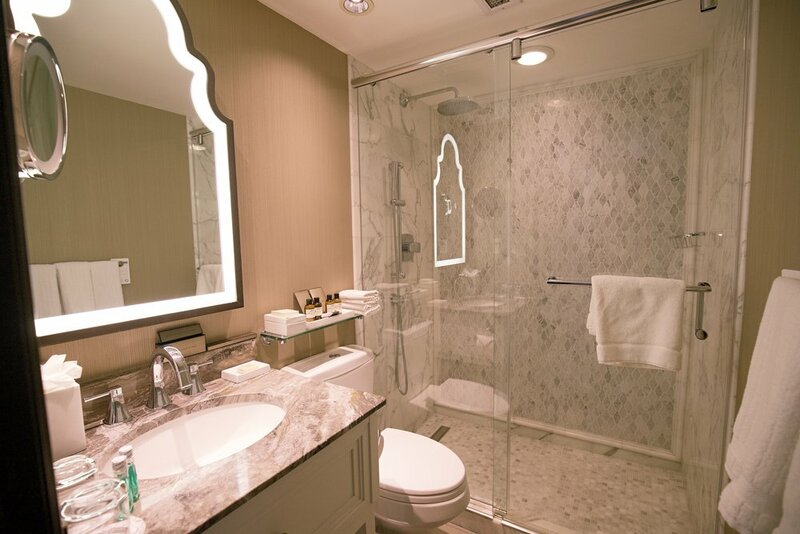 While the rooms are relatively small, they are pure luxury and the hotel itself has all you need so you don’t have to go anywhere at all. With all the hikes you need right outside the front door, it’s the best spot for completely immersing yourself in your surroundings. Even if you don’t end up staying at the hotel, go inside and enjoy the great restaurants and bars which have the best views of the lake. We ate at the steakhouse downstairs (which actually does not have a great view), but the food was delicious and the steak we ordered was cooked to medium-rare perfection. Photographing Lake Louise all depends on the weather; however, don’t be scared off by a few clouds. I was able to get the best photos later into the evening, just after the sun had gone down and most of the day visitors had gone home for the night. The iconic spot for photos is straight out the front doors of the hotel and in the evening I was able to set up my tripod and take a few shots of my husband and I without being pushed away by anyone with a selfie stick. At the least, be sure to follow the easy walking path around the lake to the other end as the tourists fade and the intimacy of your shots improves the farther you venture out. For all the first time visitors out there, I hope this guide helps you in planning a magical adventure to the idyllic Canadian Rockies. I’m always here to answer questions and help in any way I can, so don’t hesitate to reach out. Cheers!